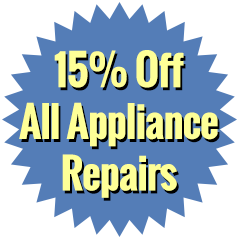 A broken appliance creates problems at your home or business. In fact, if you have damaged washing machine in your home, your clothes hamper overflows quickly. As a restaurant owner, cooking comes to a standstill if your dishwasher is broken. Depend on our prompt appliance service team to address the problem quickly and affordably. We service all major brands, and we also install new appliances if yours is beyond repair. 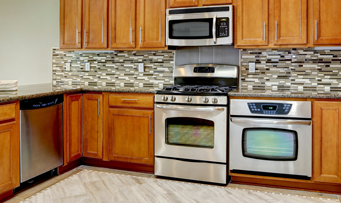 Since 2002, customers have come to trust J.R. Appliance Services to provide the exceptional appliances services that they need when things are not operating correctly in their home or business. Our technicians perform the job correctly the first time and ensure you always receive impeccable workmanship. 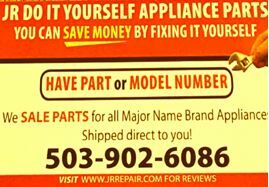 Don’t waste your time or money on appliance repairmen that won’t stand by their work. Customer satisfaction and guaranteed quality workmanship have always been the bedrocks of our business. That’s why we offer a one-year warranty on parts and a 90 to 120 day warranty on labor for all jobs. After all, you shouldn’t have to pay for another repair when the first one should have been enough. Because we are so confident in our services and we want to save you money, we extend these excellent warranties for all of our customers. 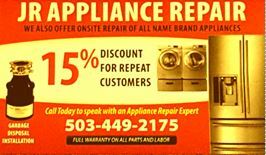 You’ll always receive the best appliance repairs when you choose our fully licensed, bonded, and insured company for services.